NASA’s rover Curiosity said ‘Goodbye Kimberley’ having fulfilled her objectives of drilling into a cold red sandstone slab, sampling the tantalizing grey colored interior and pelting the fresh bore hole with a pinpoint series of parting laser blasts before seeking new adventures on the road ahead towards the inviting slopes of Mount Sharp, her ultimate destination. 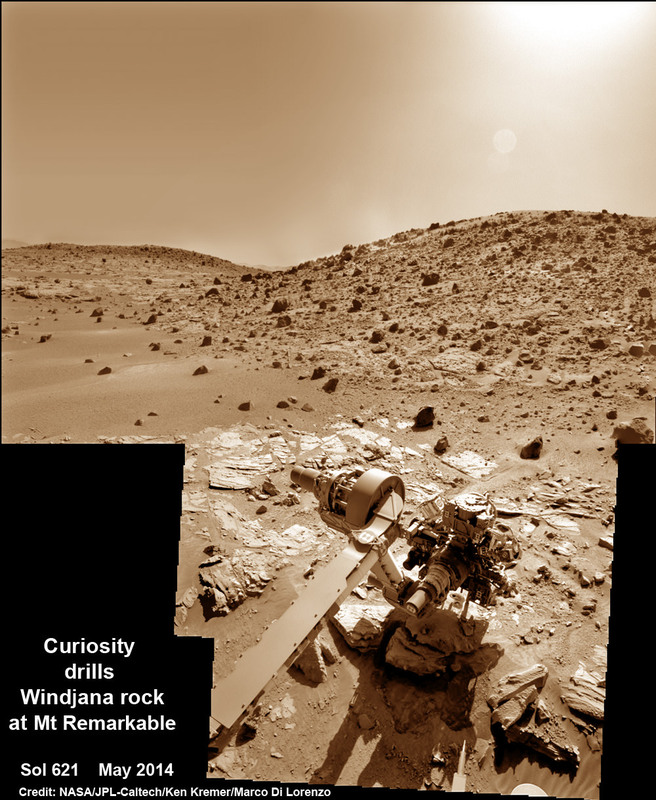 Curiosity successfully drilled her 3rd hole deep into the ‘Windjama’ rock target at the base of Mount Remarkable and within the science waypoint at a region called “The Kimberley” on May 5, Sol 621. Since then, the 1 ton robot carefully scrutinized the resulting 2.6 inches (6.5 centimeters) deep bore hole and the mound of dark grey colored drill tailings piled around for an up close examination of the texture and composition with the MAHLI camera and spectrometers at the end of her 7-foot-long (2 meters) arm to glean every last drop of science before moving on. Multiple scars clearly visible inside the drill hole and on the Martian surface resulting from the million watt laser firings of the Mast mounted Chemistry and Camera (ChemCam) instrument left no doubt of Curiosity’s capabilities or intentions. Furthermore she successfully delivered pulverized and sieved samples to the pair of onboard miniaturized chemistry labs; the Chemistry and Mineralogy instrument (CheMin) and the Sample Analysis at Mars instrument (SAM) – for chemical and compositional analysis. Curiosity completed an “intensive investigation of ‘The Kimberley’, having successfully drilled, acquired and dropped samples into CheMin and SAM,” wrote science team member Ken Herkenhoff in an update. “The initial analysis of this new sample by Chemin is ongoing, requiring repeated overnight integration to build up high-quality data,” says Herkenhoff. The rover’s earth bound handlers also decided that one drill campaign into Kimberley was enough. So the rover will not be drilling into any other rock targets here. And it may be a very long time before the next drilling since the guiding team of scientists and engineers wants desperately to get on and arrive at the foothills of Mount Sharp as soon as possible. But the robot will undoubtedly be busy with further analysis of the ‘Windjana’ sample along the way, since there’s plenty of leftover sample material stored in the CHIMRA sample processing mechanism to allow future delivery of samples when the rover periodically pauses during driving. “Windjana” is named after a gorge in Western Australia. It’s been a full year since the first two drill campaigns were conducted during 2013 at the ‘John Klein’ and ‘Cumberland’ outcrop targets inside Yellowknife Bay. They were both mudstone rock outcrops and the interiors were markedly different in color. “The drill tailings from this rock are darker-toned and less red than we saw at the two previous drill sites,” said Jim Bell of Arizona State University, Tempe, deputy principal investigator for Curiosity’s Mast Camera (Mastcam). The science team chose Windjana for drilling “to analyze the cementing material that holds together sand-size grains in this sandstone,” says NASA. “The Kimberley Waypoint was selected because it has interesting, complex stratigraphy,” Curiosity Principal Investigator John Grotzinger, of the California Institute of Technology, Pasadena, told me. Curiosity departed the ancient lakebed at the Yellowknife Bay region in July 2013 where she discovered a habitable zone with the key chemical elements and a chemical energy source that could have supported microbial life billions of years ago – and thereby accomplished the primary goal of the mission. Windjama lies some 2.5 miles (4 kilometers) southwest of Yellowknife Bay. Curiosity still has about another 4 kilometers to go to reach the foothills of Mount Sharp sometime later this year. The sedimentary layers of Mount Sharp, which reaches 3.4 miles (5.5 km) into the Martian sky, is the six wheeled robots ultimate destination inside Gale Crater because it holds caches of water altered minerals. Such minerals could possibly indicate locations that sustained potential Martian life forms, past or present, if they ever existed. Stay tuned here for Ken’s continuing Curiosity, Opportunity, Orion, SpaceX, Boeing, Orbital Sciences, LADEE, MAVEN, MOM, Mars and more planetary and human spaceflight news. That’s the momentous question posed by the international team of scientists and engineers who commanded NASA’s SUV sized Curiosity rover to reach out with her high tech robotic arm this weekend (Apr 25-27) and gather critical science measurements for high powered scrutiny of an outcrop on a Martian butte named Mount Remarkable. See our multisol, composite photo mosaic – above – illustrating Curiosity’s arm in action pressing down her X-ray spectrometer on Saturday, April 26, Sol 612, at an alien rock on Mount Remarkable at the current stopping point at “The Kimberley Waypoint” along the epic trek to towering Mount Sharp. Via a combination of laser shots, images, brushings and spectrometry the team is pondering new data streaming back daily across hundreds of millions of kilometers of interplanetary space to Earth to determine whether to bore into a sandstone slab being evaluated as the target for the missions third drilling campaign. The team deployed the arm this weekend onto a rock target called “Windjana,” after a gorge in Western Australia. After confirming that the 1 ton robot was in a stable position, the team commanded study observations on Saturday, Sol 612, using the APXS spectrometer and MAHLI camera on the terminus of the arm’s turret. “The observation will document its chemical composition and morphology before drilling,” says science team member Ken Herkenoff in a mission update. She also brushed off the potential ‘Windjana’ drill target with the wire-bristle Dust Removal Tool (DRT) to clear away obscuring Red Planet dirt and dust hindering the data collections. The rover is also conducting continuing remote sensing observations with the ChemCam, Mastcam and Navcam cameras mounted on the Mast. Today, April 27, Sol 613, “MAHLI will take another selfie of the rover” according to Herkenhoff. In early April, the six wheeled rover pulled into a scientifically enticing science destination known as “The Kimberley Waypoint” in hopes of carrying out the next drilling operation into alien Martian terrain in search of further clues about ancient Martian environments that may have been favorable for life. “We are officially in ‘The Kimberley’ now,” Curiosity Principal Investigator John Grotzinger, of the California Institute of Technology, Pasadena, told me at that time. Since arriving in the Kimberley region, Curiosity’s earth bound handlers have been maneuvering the 1 ton robot around to thoroughly survey destination “Kimberley” in choosing the best drill site. Why was Kimberley chosen as a science destination ? “The Kimberley” has interesting, complex stratigraphy,” Grotzinger told me. If Windjana meets the required criteria, Curiosity will bore into the sandstone rock, and then pulverize and filter it prior to delivery to the two onboard miniaturized chemistry labs – SAM and CheMin. Windjana would be the first sandstone drill target, if selected. The first two drill locations at ‘John Klein’ and ‘Cumberland’ inside Yellowknife Bay were mudstone. “We want to learn more about the wet process that turned sand deposits into sandstone here,” said Grotzinger, in a NASA statement. “Understanding why some sandstones in the area are harder than others also could help explain major shapes of the landscape where Curiosity is working inside Gale Crater. Erosion-resistant sandstone forms a capping layer of mesas and buttes. It could even hold hints about why Gale Crater has a large layered mountain, Mount Sharp, at its center,” NASA elaborated in the statement. To date, Curiosity’s odometer totals 3.8 miles (6.1 kilometers) since landing inside Gale Crater on Mars in August 2012. She has taken over 143,000 images. The sedimentary foothills of Mount Sharp, which reaches 3.4 miles (5.5 km) into the Martian sky, is the 1 ton robots ultimate destination inside Gale Crater because it holds caches of water altered minerals. Such minerals could possibly indicate locations that sustained potential Martian life forms, past or present, if they ever existed. Curiosity has some 4 kilometers to go to reach the base of Mount Sharp sometime later this year.